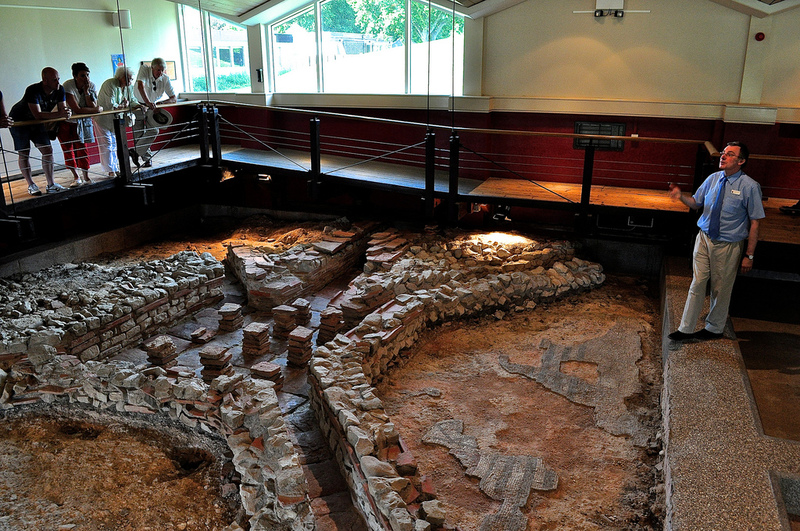 I suppose the Roman Palace at Fishbourne can be termed a ruin? It’s definitely a well thought out attraction with enthusiastic staff who bring the remains to life and you find yourself pondering about life in Roman Britain. It’s one of the biggest villa complexes in Europe – discovered by a workman in 1960 – and would have easily housed over 200 people – there’s debate over whether the key inhabitant was a Roman governor sent over to Britain or whether a local king was appointed regional administrator. But a palace it definitely was – dating back to late first-century and even possible to the invasion in AD43. What we see today is just one wing of the building – the North wing – the entire palace burnt down and the stones were robbed and reused elsewhere (see Chichester’s walled city for example!) 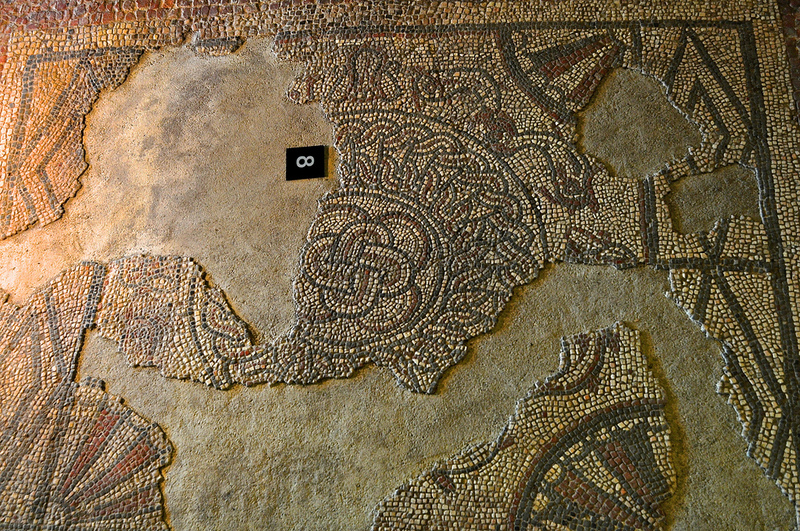 but they left the mosaic floors as unusable. 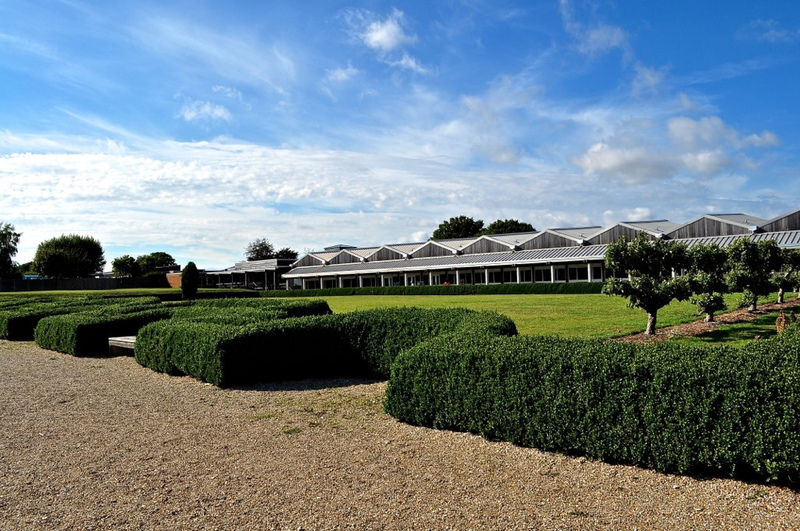 There is even one half of the central garden – now replanted and laid out on its original Roman plan – yes – the archeologists can even see where trees were once planted! England’s first formal garden? The rest of the palace lies under a motorway and a row of houses but there would probably be little left today. It is however easy to imagine how it must once have been and you can see how impressive and imposing this structure must have seemed to the local populace. 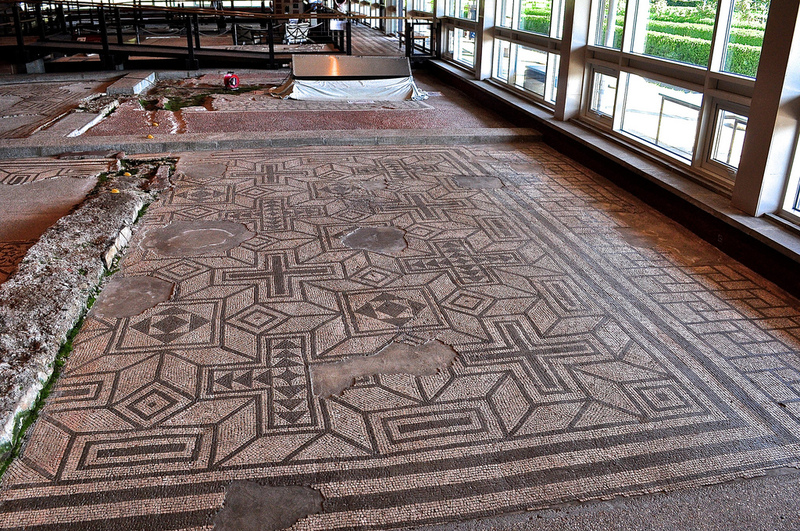 I love the idea that the guide mentioned – that mosaic specialists would have wandered from rich family to rich family – with examples of the floors they could do and their own style! 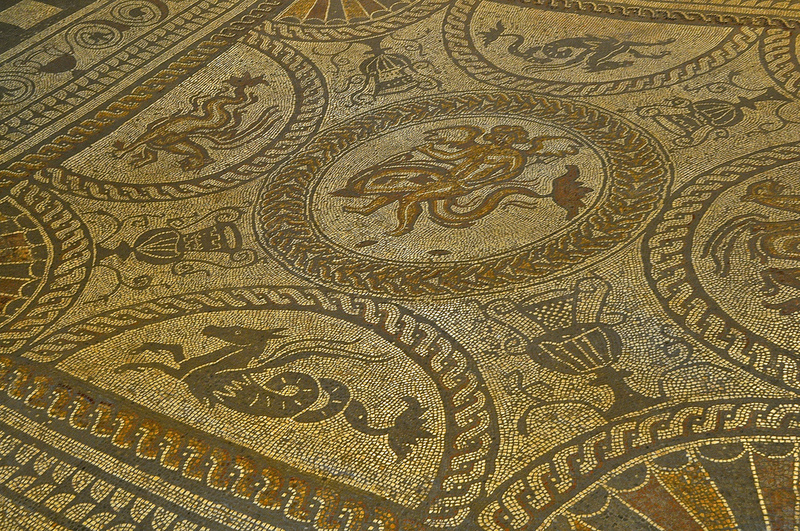 These were primarily black and white … with the famous Dolphin floor added at a later date – actually on top of an existing mosaic – this had colour and must have been spectacular in the day. 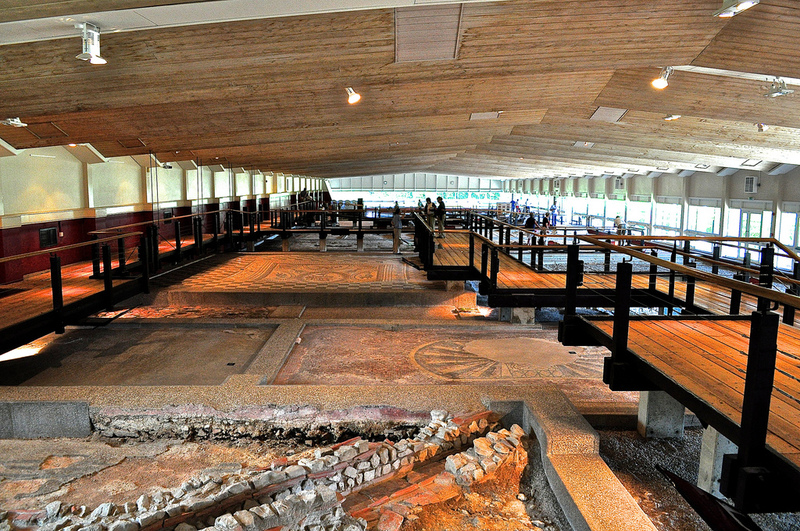 If you are interested in the Romans, you will like Fishbourne and you will probably marvel like me that so much has been found from so far ago – and in such great condition. 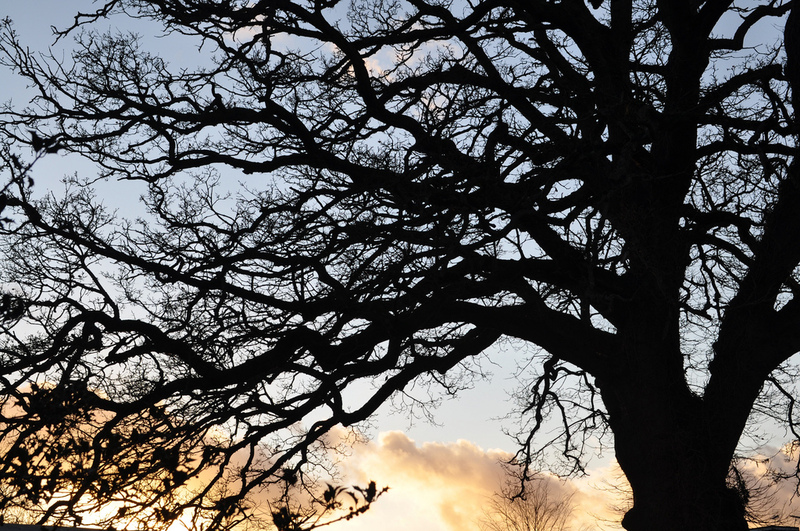 Do take advantage of the free 30-minute tours – they are well worth waiting for. 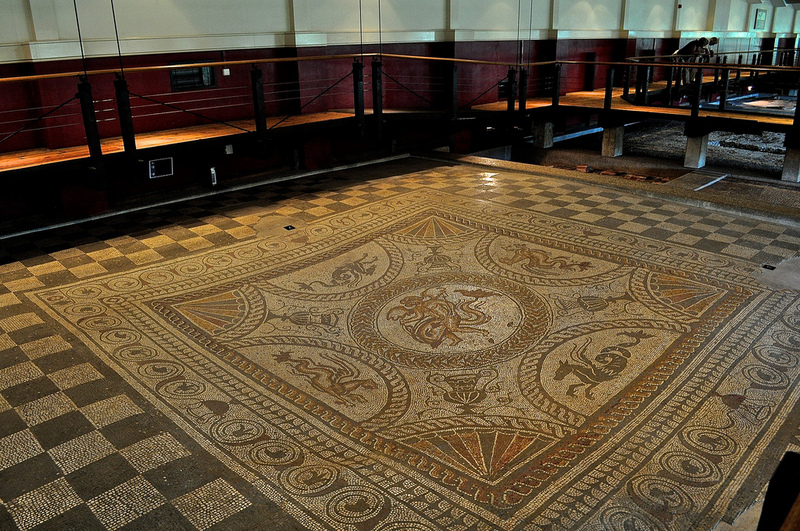 If you have got the mosaic bug, you can even attend a mosaic masterclass on site. Now there’s an idea …. For more information, click here – it’s only GBP8.50 for an adult entry and currently – happily – there’s a 50% discount if you are a member of English Heritage. I have been there 30 years ago and been interested in Roman history ever since. At the moment I’m in Rome. That’s on my bucket list – have been there many years ago but did not really appreciate it when I was younger!